Splashwear > swim spray chlorine remover clearance! Spray SwimSpray on your hair and skin. Use your favorite shower products (shampoo, body wash, conditioner, etc.). "Having dealt with dry skin my whole life, I've always had issues with the post-swim chlorine irritated skin, even after multiple showers. Ever since I started using swim spray, all those issues have disappeared. No more irritated skin, no more chlorine smell. Where was this product 20 years ago?" - Andrew S.
“Did you guys even swim today?” - Parent picking up swimmers after club practice commenting on the absence of chlorine smell after using SwimSpray. "I've been using SwimSpray two to three times a week for the last few months with great results. So great, I have forgotten what it was like to not use the stuff until today. I swam tonight, have showered twice and can still smell the chlorine a mile away. Never again, will I not use SwimSpray after I workout." - Jim S.
“I swim every morning and SwimSpray is the first product I've ever used that keeps my colleagues from telling me I smell like chlorine everyday! I also use it on my 1 year old son to keep his skin from drying out after swim class. I love the versatility of SwimSpray!” - Sean D.
"Even though I love to swim, I used to pick going to the gym to work out instead of the pool because of the chlorine. Not anymore! 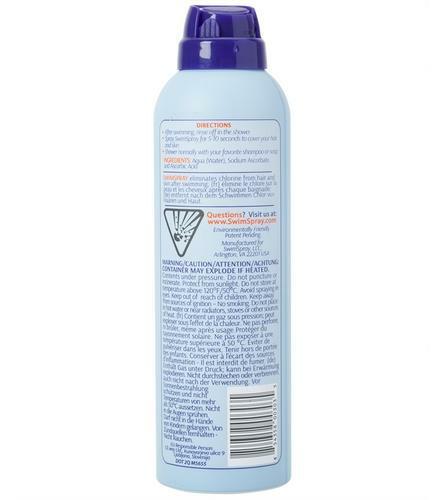 Swim Spray is a fantastic product that gets rid of the harsh chemicals from the pool. And I love that it's all natural because I am very conscientious about the products I use on my sensitive skin and color treated hair. Thanks Swim Spray!" - Tara M.
"I swim most mornings before class. And even though I showered, I always got some weird looks from people sitting around me. But it wasn't until my best friend told me, "Man, you really smell. You reek of chlorine!" that I realized why everyone was looking at me and began feeling self-conscious. Now, with SwimSpray, I don't have to feel self-conscious anymore and I'm not the smelly kid in class!" - Brendan C.